I received the best and worst mail this week. 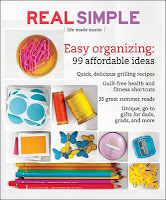 The latest issue of Real Simple arrived and so did a letter informing me that my subscription was about to run out! I am not crafty and I do not cook, but I love my Real Simple. My sister and I used to give each other a subscription every year (until she had kids and no time for magazines); I stopped getting it for a while and restarted my subscription last year. I quickly realized why I loved it in the first place. It is the best magazine. Ever. I wonder if I could get a lifetime subscription to it.